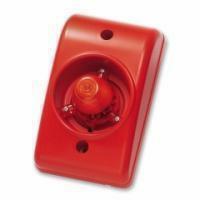 Fire alarm horn strobe KS-FS103 is designed to alert other audibly and visually. Bright red color housing makes it suitable for indicating fire emergency. The strobe protrudes out the center to visually alert nearby of impending danger. 12V-28VDC, (typical voltage: DC 24V). Siren tone: sweep, bell, whistle, etc. 1 pc/box: 50pcs/inner ctn. ; 100pcs/ctn.